AN AMERICAN LITERARY ICON – Many would argue that Samuel Clemens, best known by his pen name Mark Twain, is quite simply one of America's greatest authors. On this magnificent journey along the Upper Mississippi River, you will delve deep into the life and work of Samuel Clemens as you witness his legendary words and wit brought to life onboard by an expert tribute artist who will leave you with the lasting impression that you just had an in-depth conversation with the legendary author himself. Our included Hop-on Hop-off tours allow you to explore Twain's childhood hometown of Hannibal, Missouri; the town from where much of the inspiration for his beloved classics such as The Adventures of Tom Sawyer and The Adventures of Huckleberry Finn is derived. 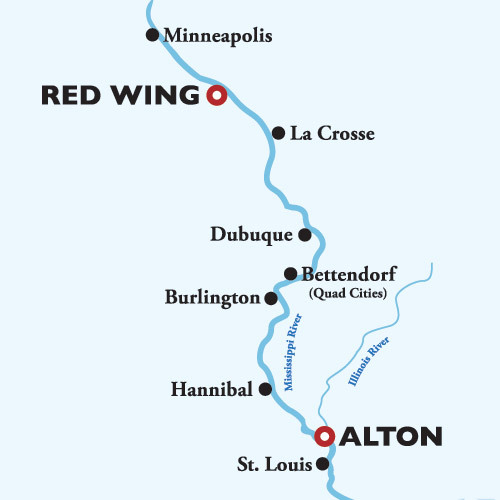 You will not want to miss this opportunity to share the Mississippi River with Mark Twain.